In another life Ramiel was married to Elise before she became the Vampire Queen, but now he is the Guardian Angel of her daughter Izzy for his final test as an Angel of Retribution. The biggest problem that Ramiel has is his temper, and then his anger over Elise being happy and moving on with her life after his earthly death. Now Izzy has been kidnapped by Lucifer and Ramiel is determined to rescue her on his own. The problem is that he needs the help of a fallen to get into hell, and that requires a bond, which is not in his plans. Throughout this book there are also glimpses into life at Zerum and updates on all your favorite couples and characters from earlier books. 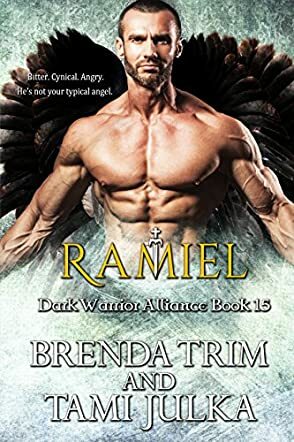 Ramiel is the fifteenth book in the Dark Warrior Alliance series by authors Brenda Trim and Tami Julka. The Dark Warrior Alliance is an amazing series, especially given the fact that Ramiel is book number fifteen. Authors Brenda Trim and Tami Julka still are able to weave a story as fresh and new as they did in book one. Personally I have read every book in this series, and I am always amazed at how the authors are able to weave the story without repeating plot lines and ideas. Each book is new and unique, and could, if needed, stand alone, but the story makes more sense when the books are read in order. Ramiel again is able to pull the reader in and have them feeling as if they are part of this unique and varied world. These are definitely adult books, as there is a good amount of talk about fated mates and the intimate acts that go with it, yet at the same time the writing about those acts fits the story and the descriptions are not overly graphic. There is also a lot of violence between the Warriors and the Demons, but that is to be expected when you are talking about Lucifer wanting to take over the world and get rid of the human population.